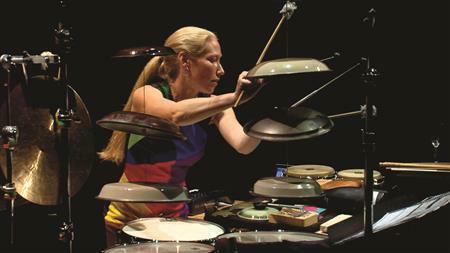 Bonnie Whiting is Chair of Percussion Studies at the University of Washington in Seattle. She performs and commissions new experimental music for percussion, seeking out projects that involve non-traditional notation, interdisciplinary performance, and the speaking percussionist. Recent work includes a series of performances at the John Cage Centennial Festival in Washington DC, solo appearances with the National Orchestra of Turkmenistan, and as a soloist in Tan Dun's "Water Passion" under the baton of the composer himself. Her debut album, featuring an original solo-simultaneous realization of John Cage's "45' for a speaker" and "27'10.554" for a percussionist", was released on the Mode Records label in April 2017. Whiting has performed with many of today's leading new music groups, including the International Contemporary Ensemble, Ensemble Dal Niente, red fish blue fish percussion group, and as an improviser with the University of Washington’s new Intercontinental Experimental Ensemble.